27th President of the United States and 10th Chief Justice of the United States. 2 Find A Grave, (accessed 09/24/2012). 3 New England Historical and Genealogical Register, (New England Historic and Genealogical Society), 1915, Vol. 69, p. 210. 4 The American Genealogist, New Haven, Connecticut: D. L. Jacobus (issues newer than 5 years not online), 1945, Vol. 22, pp. 205-210, New England Historic Genealogical Society (Online Database). 6 Roberts, Gary Boyd, The Royal Descents of 600 Immigrants to the American Colonies or the United States , Baltimore: Genealogical Publishing Co. (2008), 168, 563. 7 Roberts, Gary Boyd, comp., Ancestors of American Presidents , Boston: New England Historic Genealogical Society (2009), 406, 429, 433, 444, 459, 462-463, 481, 486, 489-490, 583. 8 Rockwood, Vivian VaLera, Four Centuries of American Descendants of Richard Rockwood of Dorchester 1633, Braintree 1636, Massachusetts, Johnson City, Tennessee: Overmountain Press (2000), 1175-1177. 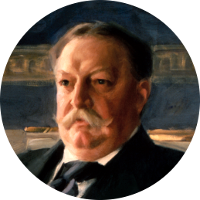 9 Wikipedia, "William Howard Taft", (accessed 09/24/2012).